Our technology is based on an absorption process and a compression process, utilizing a mixture of water and ammonia. A Hybrid Heat Pump is built with standard ammonia compressors, with a design pressure of 25 bar. A traditional heat pump using pure ammonia, can heat water to 50°C at this pressure. A Hybrid Heat Pump can heat water to 120°C using the exact same equipment. It can cover a whole new range of temperatures than traditional heat pumps, meeting the demands of a lot of industrial processes. The invention itself is not new. The absorption/compression process was patented by August Osenbrück in 1895. The problem was turning the process into a robust and commercial product. With its patented technology, Hybrid Energy made it possible with its first commissioning in 2004. The solution exiting the absorber/condenser is rich with ammonia and passes through an expansion valve where the pressure drops. 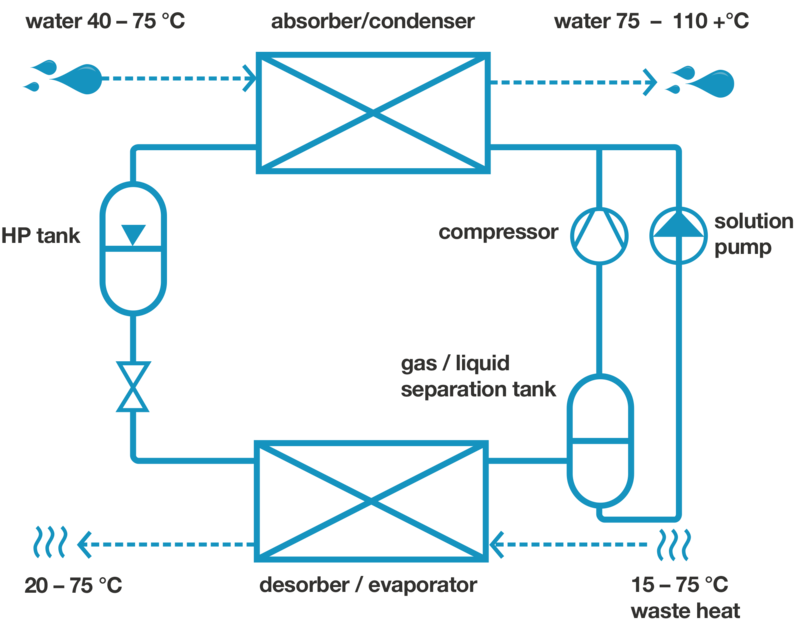 As the solution enters the desorber/evaporator, ammonia is boiled out of the solution when heat is absorbed from the heat source, and the process is repeated. As the mixture of water and ammonia is a non-azeotrope working medium, the boiling and condensation will take place with gliding temperatures. In the absorber/condenser the concentration of ammonia will increase through the heat exchanger, and the temperature will drop (the saturation temperature for ammonia is considerably lower compared to water). Conversely, in the desorber/evaporator the ammonia concentration will wane, and the temperature will rise through the heat exchanger. For many processes, this is a huge advantage. If the heat source is water at 40 ˚C to be cooled to 10 ˚C, and the heat sink is water at 50 ˚C to be heated to 90 ˚C, the temperature glide of the working media can be adjusted to the temperature glide of the heat source and sink. Compared to a heat pump with a pure working medium with constant temperatures during condensation and boiling, the compressors in a Hybrid Heat Pump will work with a lower temperature lift. This gives the Hybrid process exceptional COPs (heat produced/electrical input) when you have large glides on hot and cold side.